30-day guitar challenge: Give your first finger a rest and treat the remaining three digits to a spot of fretboard fitness training. Here, we're focusing on fretting-finger dexterity with some exercises designed to test and improve control, independence and stamina between your fingers. As an added challenge, we’ll concentrate our efforts on what is for most people the weaker side of the hand and use only the second, third and fourth fingers, taking the more naturally strong first digit of the equation. Players like George Lynch and Paul Gilbert actually favour using these fingers (certainly for practice regimes), but this could be because they have a huge amount of talent, remarkably long fourth fingers - or both! The exercises use a combination of legato technique and picking, which should help give you a broader palette of sounds to work with. Feel free to experiment with how you apply the techniques. The legato technique is particularly good for developing the strength and uniformity of tone heard in players like Joe Satriani, Allen Hinds, Brett Garsed and Allan Holdsworth who all have phenomenally consistent fretting hands. A common problem for mere mortals is that each finger has its own hammer-on strength, making the flow of notes sound uneven in volume (you might need to go more softly with your second finger and be more vigorous with your fourth, for example, so they meet somewhere in the middle). Practising legato is much more effective with a mid-gain overdrive that responds to finger dynamics, rather than a full-on saturated tone, which automatically compresses the note - masking any weaknesses you may have. Examples 1 and 2 are chromatic-based shapes using the second, third and fourth fingers played on three adjacent frets. The first exercise uses hammer-ons throughout, while the second is based on pull-offs. In both cases, play the first bar three times, then for the fourth bar double the rate of notes. Speeding up in short bursts like this is a very effective way of increasing finger stamina. Another common problem that needs attention is note-length consistency. The first two examples are based on a triplet subdivision but Example 3 is 16th notes; regardless of the chosen division, the important thing is that they are played evenly. Each triplet should be the same length as the next and all the 16th notes should be consistent. Sound simple? Well you might not find it so in practise, as it can be tricky to control the timing between the third and fourth fingers, so lazy pull-offs or early hammer-ons can disrupt the flow. Example 4 is a Steve Morse-style string-skipping lick that will really help develop elasticity between your fingers when changing strings. As this is a bit trickier you can alternate-pick the notes to relieve some of the tension on your fretting hand. Until now we have only used chromatic-based shapes, so for example 5 we have a more scale-based shape using both tone and semitone spaces. Placing tone spaces between the second and third fingers and third and fourth fingers will help develop the stretch of your hand. Work through the examples slowly and stay relaxed so as to avoid hurting yourself. Play the 10th fret with your second finger, hammer-on to the 11th fret with the third and onto the 12th fret with your fourth. Next, pull-off back to the 10th fret and repeat the three notes. Now move over to the first string and play the pattern again. Repeating the first bar three times and play the fourth at double speed. This example uses the same frets as the previous lick, only played in reverse order starting with your fourth finger at the 12th fret. Try playing the same lick on different string groups as the thicker wound strings will have a very different feel (and resistance) to the thinner treble strings. This lick is a combination of Examples 1 and 2 as it involves hammer-ons on the way up and pull-offs on the way down. This time the notes are played in a 16th-note subdivision, which means that each finger has a chance of matching up with the downbeat, rather than just the second or fourth finger. Watch your timing. Play this lick using one-finger per-fret with your second finger at the 15th fret and your fourth at the 17th. 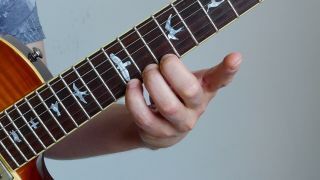 Use the same two fingers when jumping between the fourth and third strings; for the 17th fret notes, barre across the strings and use a little palm-muting to help keep the notes separate sounding. This G Dorian idea (1-2-b3-4-5-6-b7) starts with the first three scale notes: G-A-Bb. This puts a tone space between second and third fingers. The next position uses A,-Bb-C, which has a tone space between third and fourth fingers. The final position uses notes Bb-C-D which puts a tone space between all three fingers.